"Now & Then" is the fifth album from the Carpenters, released in 1973. The title for the album was suggested by Richard and Karen's mother, Agnes Carpenter. 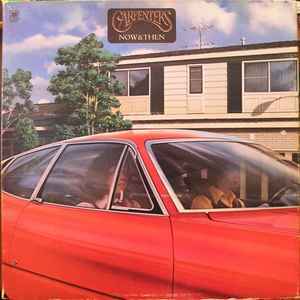 The album featured a three-panel cover that folded out, showing a panoramic view of Karen and Richard Carpenter driving past the Carpenter family home on Newville Avenue in Downey, California. The car pictured on the cover was a 1973 Ferrari 365 GTB/4 ("Daytona") owned by Richard. Side 2 features an oldies medley. The medley features Tony Peluso, the Carpenters' guitarist, heard as a radio DJ throughout the medley. This is the original pressing which is a triple gatefold.. This album features some of their greatest hits, including Sing, This Masquerade and Yesterday Once More. Side B contains an oldies medley complete with sound effects and a radio DJ announcing the songs. The recording quality is poor with lots of groove distortion and scratches. This is the reissue on a normal sleeve rather than the triple gatefold of the original pressing. This album features some of their greatest hits, including Sing, This Masquerade and Yesterday Once More. Side B contains an oldies medley complete with sound effects and a radio DJ announcing the songs. The recording quality is amazing and the album really sounds alive. Is it logical that a Brazilan record has the Dutch rights society on its label? I have a copy that has the run off handwritten AMLH 63519 A-3 'triangle' G for side 1 and X for side 2! Are they different on each pressing? Pop Rock / Soft Rock / Yéyé by Satchamo.